Before we begin, note that SqlBulkCopy can only copy data to the database table, it cannot create either table or missing columns inside the database. Now let's focus on the C# code. The code will first open a SQL connection with using statement. This way, we don't need to close the connection ourselves. Then we will map the columns in DataTable to the columns in the database table. Next, we set the destination table name in SqlBulkCopy and finally call WriteToServer method to save the data to the server. The code is below and after that, the yellow highlighted lines are explained in more detail. First, we need to have a connection string. Set Data Source to your SQL server and instance. You also need to set Initial Catalog to your database name. By setting Integrated Security=true, we tell it to connect to the database using Windows Authentication. To learn more about Connection Strings and their parameters, check this article. This code will do the mapping between the DataTable columns and database Table Columns. In the above example, we assume that all columns in DataTable will map to the Columns with the same name in the SQL table, so the arguments in ColumnMappings.Add method are the same for both source and destination columns. You can also map the columns between different names or map it using column indexes instead of names. Here we set the SQL destination table that the sqlBulkCopy will use to DataTable name, but we could simply use hardcoded string. This is where the saving of data happens. We use our DataTable object as an argument in WriteToServer method. The method is wrapped with try / catch block, so any exception will be caught and written to console. 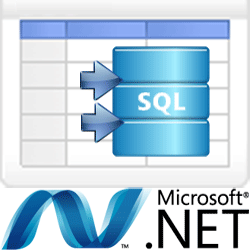 If you need to copy data in the DataTable to SQL database table, you don't need to use ADO.NET, create an INSERT statement and loop through each row, instead you can simply use the SqlBulkCopy class using WriteToServer method that accepts a DataTable object as an argument. I hope you have found the article useful. Did you have the same problem and if so, how did you solve it? Let us know in the comments. Thank you for a clearly laid out example! how can we remove if datatable contains empty rows?